Be the first to share your favorite memory, photo or story of Alease. This memorial page is dedicated for family, friends and future generations to celebrate the life of their loved one. Alease Frazier was born on July 26, 1918 in Amelia County, Virginia. 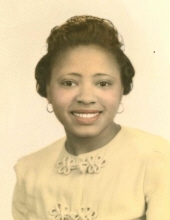 She was the daughter of Rosa Conway and John Frazier and was the first child of four sisters, six brothers, one step brother and four step sisters. She attended school as a child for awhile and then left to help out with the family. Alease then left Virginia in her early twenties and moved to Brooklyn, New York where she met her husband James Sanders. They were married July 3,, 1943. James was in the U.S. Navy. Alease worked odd jobs until she began working for the East Orange, NJ Board of Education. She was a member of Mount Olive Baptist Church in East Orange. There, Alease sang in the choir and was head of the floral club. She was a member for over four decades. Though living in New Jersey, she would always go back to her childhood church in Amelia, VA, the Flower Hill Baptist Church. As time went by, she became a member of the Union Baptist Church in Orange. Alease leaves behind one son, Todd F. Sanders; one grandson Jonah N. Sanders; one god-daughter Cynthia Crockett. She also leaves nieces Sandra Murry Scott, Sandra Jackson, Sheila Larue Frazier and Rosalind Jackson; nephews Raymond Murry, Benjamin Murry, Jr., Russell Murry, Daniel Jackson, Kenneth Jackson, Irwin Jackson and Mark Frazier. She also leaves a host of cousins, other relatives and friends throughout Virginia, New Jersey and Alabama. Alease turned one hundred years old this year. She will be forever missed. Funeral Services Saturday, October 6, 2018 at 1:00 p.m. at Flower Hill Baptist Church, Amelia. Viewing will be at the church from 11:00 a.m. until time of service. Interment church cemetery. To plant a tree in memory of Alease Sanders, please visit our Tribute Store. "Email Address" would like to share the life celebration of Alease Sanders. Click on the "link" to go to share a favorite memory or leave a condolence message for the family.